A combination of stellar design and good performance, Audio-Technica ATH-M40x is surely a headphone you would like to buy. Launched in the year 2017, this headphone looks and works great. Audio-Technica ATH-M40x studio headphone is also the number one selling headphone because of its sound quality. If accuracy in sound is what generally attracts you, then this headphone makes a great choice for you. Your sound and studio experience will be enhanced with the flat tuning base of the headphone. The feel of the headphone is sturdy but comfort wise that won’t be an issue. You’ll be able to control the headphone with various options available and also customize it according to your need. The highlight of Audio-Technica ATH-M40x headphone is the passive noise isolation feature, which will surely block the noise of the environment. Being a passive feature, it might not completely block the sound, but it does the needful when you hear the music on the go. If you buy a professional studio headphone it might cost you a bomb. This won’t be a case with Audio-Technica ATH-M40x headphone. This headphone is not only superior in quality but price wise too this headphone is quite affordable. 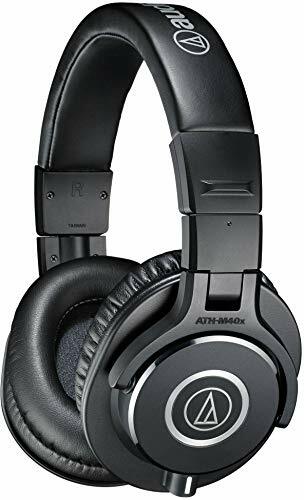 If you are a professional who loves to mix music and create new sounds, well then this studio Audio-Technica ATH-M40x headphone can be quite handy for you. From mixing music to studio tracking, you can use the headphone in every possible way. It’s also useful in DJ monitoring, so professional DJs can also use the headphone. If quality is what you look for in a headphone, then this headphone will strike you instantly. The professional grade earpad provides complete comfort and gives a great grip. You won’t feel any pressure on ears even if you wear the headphone for hours. If you hear music all the time, then carry these headphones everywhere you go. Who doesn’t love gaming? Well, if gaming is on your mind too, then this headphone is for you. The headphone has a deep bass base and that gives a nice punch for gaming. You can enjoy hours of gaming experience with Audio-Technica ATH-M40x headphone. It’s a balanced headphone with great concept and design. It’s for people who love simple and less confusion of many added features. For simplicity and clarity in sound, this can be an ideal choice for sure. It’s safe to carry Audio-Technica ATH-M40x headphone while traveling too. As it can be easily folded, you can carry it in any case. So, whether you are traveling by plane or car, it can be quite handy to carry the headphone along with you. The unique set will surely give an edge as compared to other headphones available. There are many great features of Audio-Technica ATH-M40x headphone; let us take a look at some of the key features. The high frequency of Audio-Technica ATH-M40x is 24000Hz, which is simply great. Audio-Technica ATH-M40x has a low frequency of 15HZ. The Audio-Technica ATH-M40x headphone has low impedance but the sound quality of the headphone is great. This also depends on the environment and noise. The actual sound pressure level of Audio-Technica ATH-M40x is 98Db/mW as compared to other headphones, it’s better. The headphone does not require a battery, so you do not need to worry about the charging and replacing the battery. You can do without a battery as well. The Audio-Technica ATH-M40x headphone can be tuned flat for amazingly correct sound monitoring across the complete frequency range. This is again a great feature of the headphone. The headphone provides great sound isolation even in a noisy environment, so you can relax and hear your music well. The headphone has stereo speakers that help to give excellent sound quality with crisp sound. Headphone features 40 mm drivers with earth magnets and aluminum wire coils, which are copper based for a great experience. Audio-Technica ATH-M40x headphone has straight plug support and that is a very handy feature. The headphone has a neodymium magnet base that makes it too comfortable and durable. It features an open twisted cable jack connection that is stable all the time. Audio-Technica ATH-M40x headphone has a separate Bluetooth adapter/amplifier that can be easily converted from one option to another. Wired connectivity can also be converted into wireless connectivity with this unique feature. The ear cups of the headphone can rotate a full 90 degree. This feature is superbly good. In fact, this makes it more popular amongst professional music mixing artists and DJs. The headphone comes with cutting-edge engineering as well as tough construction design and that makes this headphone popular and top rated. Comfort wise, Audio-Technica ATH-M40x headphone needs to be adjusted. If you initially use the headphone, then you might not feel so comfortable. But, once you use it, you will feel more relaxed. So, comfort slowly builds in case of this headphone. The headphone is great with medium and small head size. It could pose a problem if your head size is big. As the Audio-Technica ATH-M40x headphone has a good back design, the comfort actually depends on the individual person. Once it fits well, you can wear the headphone for several hours at a stretch. As the headphone has noise isolation feature, it is quite handy on the go. The headphone has passive noise isolation and that makes it a tad different from other headphones that are available in the market. Overall, the passive noise isolation can be great but this again depends on the noise or sounds. It also depends on the place you are using this headphone and the purpose for. Audio-Technica ATH-M40x headphone has passive noise isolation feature and that works great. You may not be able to hear the voices around you if you are listening to your playlist or your music. Though, it does not cancel the noise completely as it does not have the noise cancellation feature. Still, it does the job for isolation. It cannot completely cut the sound if you are traveling. Most people still prefer the active noise cancellation feature to passive noise isolation. But, you can get noise reduction with this feature as well and that is good enough at the price. Audio-Technica ATH-M40x headphone is designed keeping in mind the large sessions. The design and build are quite durable. As its studio designed, the build is quite comfortable. The ear cups are fully padded and dense completely covering both the ears. The best part is its sturdiness. Even if you drop the headphone several times, it will not break. Though, it’s not too comfortable for high-density activities. There are no in build control options in Audio-Technica ATH-M40x headphone and that is again an issue. Look wise, it’s still a great pick. Audio Technica M40x is a good sounding pair so you don’t have to worry about the sound quality or the overall performance of the headphone. The headphone has extended bass that balances the sound quite well. It also has a great sound quality in the mid-range. Both, high range and mid range frequency of the headphone is great. Though it’s not ideal to block low-frequency noises still it makes up with other great features it offers. High volume or low volume, the performance of this headphone is truly good. Audio-Technica ATH-M40x is quite sorted because it does not require any battery. Yes, you heard that right. The headphone works without any added battery or chargeable battery. You can hear nonstop music or use it for professional mixing purpose. There is no battery required so this is actually the best feature of this headphone. You don’t have to worry about the charging and playback time. Stay tuned to your music all the time. It has a very balanced sound profile. The design feature is great. It comes with a good bass support. The detachable cables are good. The passive noise isolation feature is great. Comfort wise it is not too great. Connecting cable can pose an issue. There are no audio controls. Isolation depends on the environment. You might feel the bass to be little less. So many headphones are available today so it’s important to make the right choice. Audio-Technica ATH-M40x is great for music mixing and professional needs. This studio monitor headphone is not only comfortable and durable but price wise, it is also affordable. It’s a complete package if you are searching for a good headphone to rely on. With superb sound quality and great connectivity, this should be your ideal pick. Design wise also, this headphone is a perfect choice. You will not get a budget headphone with such great features and this headphone perfectly fits in. It is flexible and it is durable for your regular use.